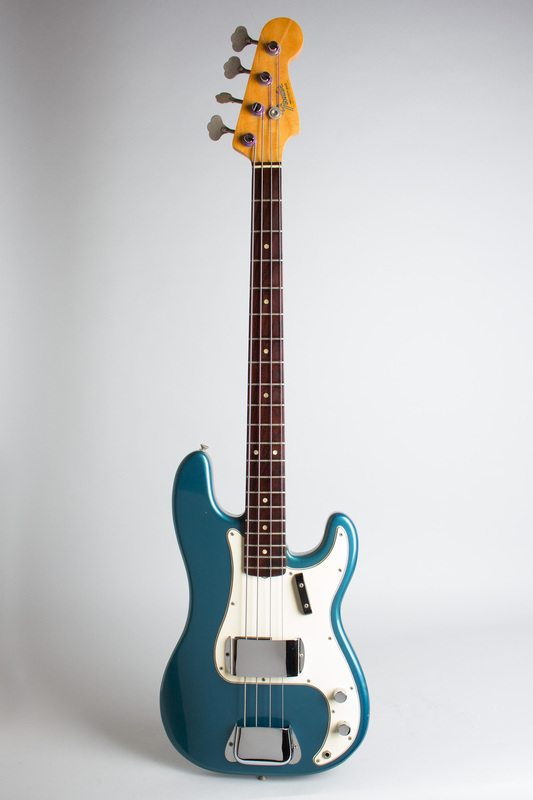 Fender Precision Bass Model Solid Body Electric Bass Guitar (1966), made in Fullerton, California, serial # 150842, Lake Placid Blue lacquer finish, maple neck, rosewood fingerboard, alder body, original black hard shell case. 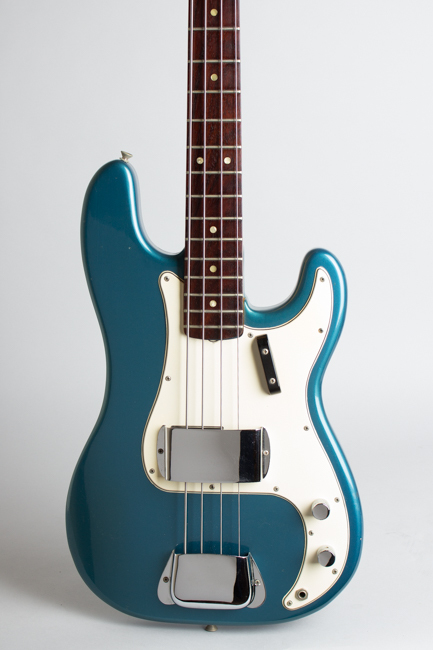 This is a superb example of an early CBS-era Custom-Color Fender Precision Bass, appearing very little played since new. 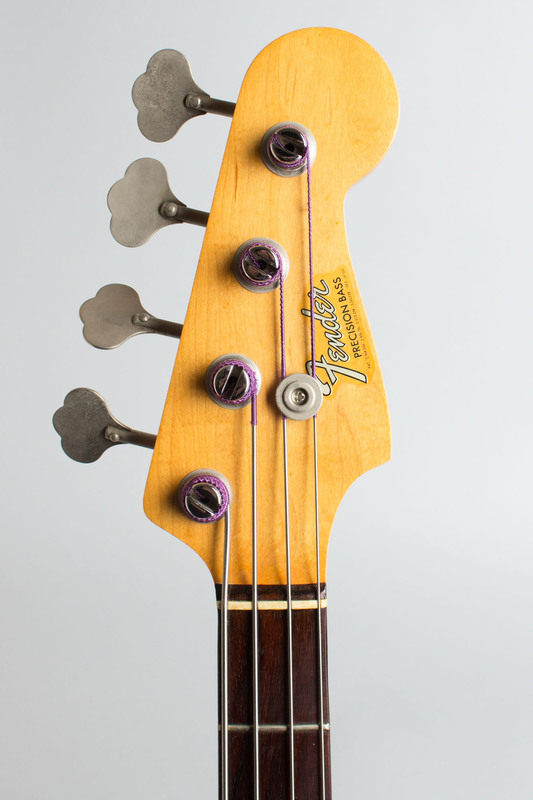 CBS had owned Fender for about a year and a half when this bass was built; it shows only cosmetic changes from the pre-CBS pattern and still retains the feel of Leo's earlier instruments. 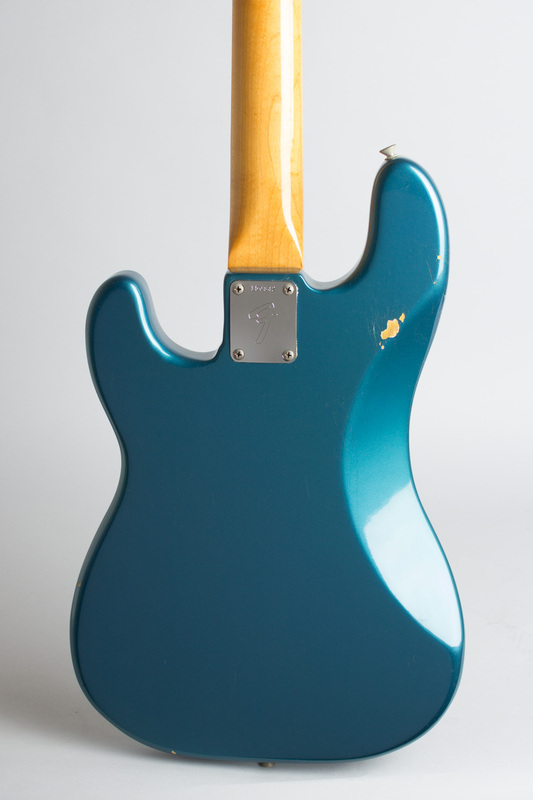 Typical features for this period include a thin rosewood fingerboard with pearl dot inlay and the then-new larger frets, the silver "transition" Fender logo decal on the headstock, and a thick 3-ply white plastic pickguard in place of the earlier greenish nitrocellulose piece. 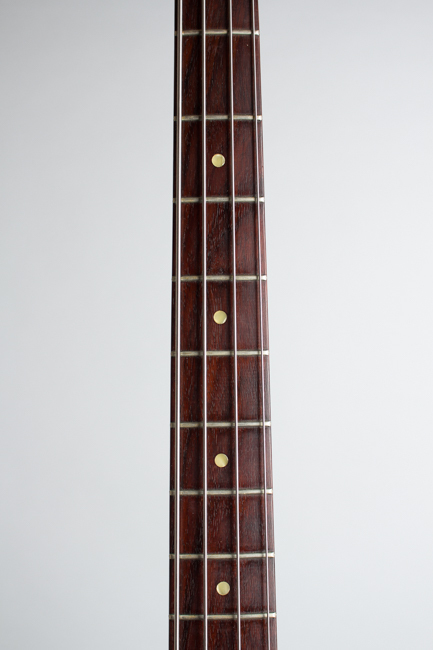 Of course the most notable feature on THIS bass is a beautiful unfaded Lake Placid Blue lacquer finish on the body, which has retained its color extremely well over 50+ years. 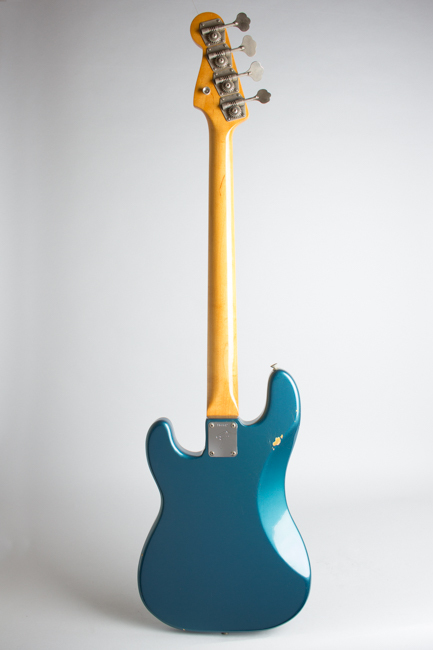 The pots are dated to the 12th week of 1966; we snuck a look under the pickguard to verify the electronics are untouched but as there is no finish chipping around the neck pocket we have elected not to dismount the neck to view the date stamp. It is almost certainly dated sometime in the spring or early summer of 1966. Besides its stunning looks, this is a superbly light and resonant bass; an effortlessly excellent player. We often find that 1966 era Precisions have a distinctive sound, a bit brighter than earlier versions and with a midrangey growl. This is a truly outstanding example. 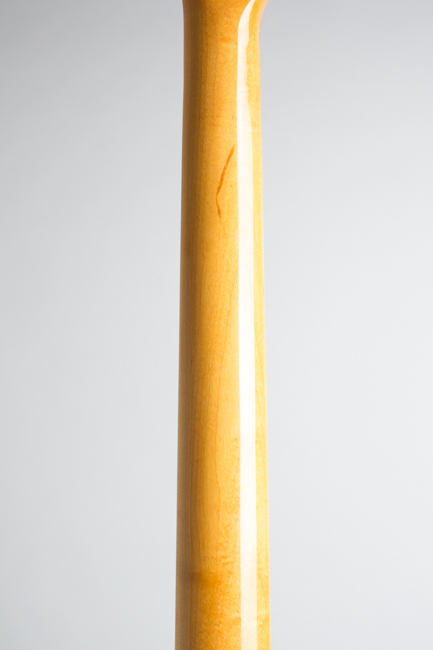 Overall length is 45 in. (114.3 cm. ), 13 in. (33 cm.) wide at lower bout, and 1 1/2 in. (3.8 cm.) . Scale length is 34 in. (864 mm.). Width of nut is 1 3/4 in. (44 mm.). 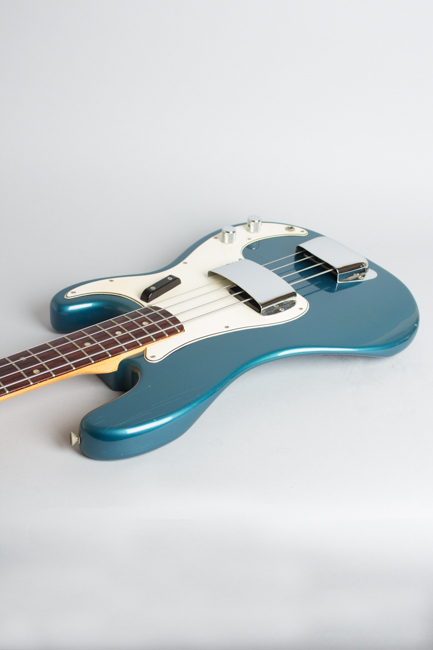 This bass is the cleanest and most spectacularly original custom-color '60s Fender we have seen in a while, a true beauty in its barely worn metallic blue livery. It is also original down to the lase screw! There are a few small dings around the edges and a larger one on the back -- "just enough to show it's real" was the first comment here! The body finish also shows some VERY light checking, almost unnoticeable. 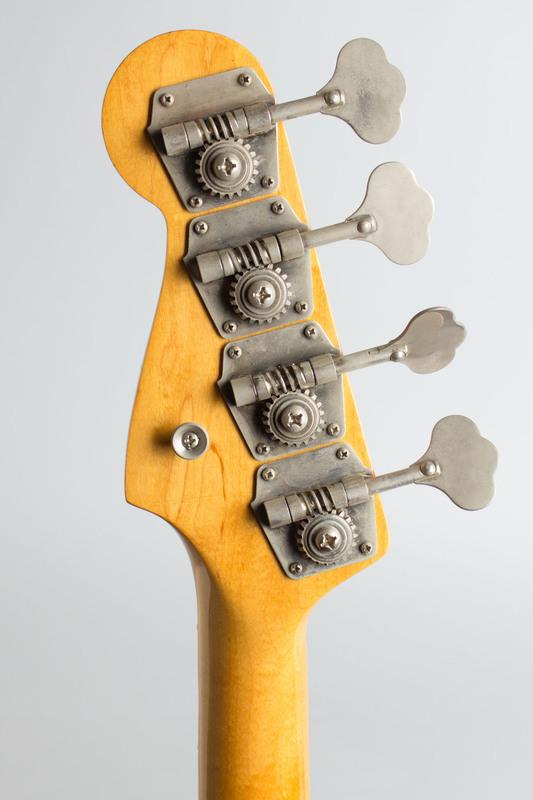 The nickel-plated tuners have a bit of corrosion, while the chrome hardware still shines nearly perfectly. 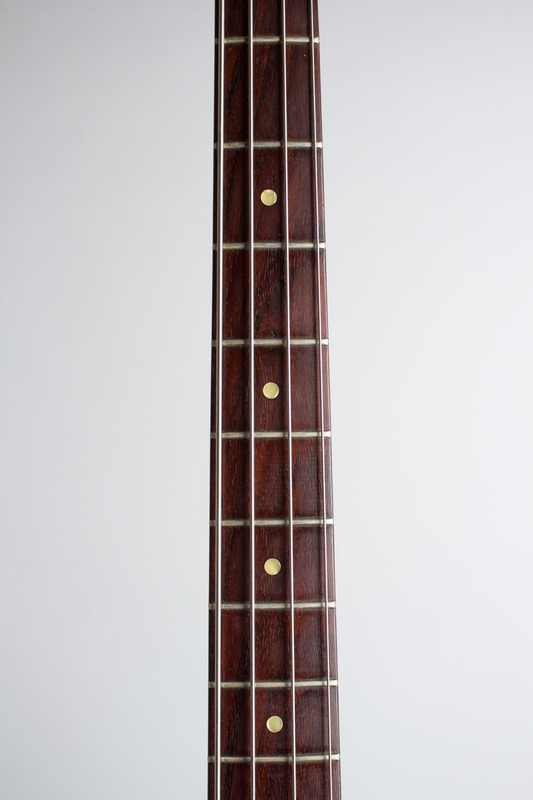 This bass looks to have been out of the case only a tiny percentage of its time on earth, and the case itself is original and well-preserved as well, with some overall cosmetic wear and a bit of loss to the leather ends. Excellent + Condition.